Built Rite Reliance was featured in a recent Boston Globe article on the use of 3D Laser Pprinting for making molds for injection molding. Click here for full article in the Boston Globe. Below is the story from the Globe. At first glance, there’s nothing high-tech about a stainless steel door hinge. Unless it’s made by Desktop Metal. But the company isn’t a Rust Belt relic — a metal-casting company left over from the glory days of America’s Iron Age. It’s a modern startup operating out of an office park in Burlington. The hinges at Desktop Metal aren’t cast in molds or stamped in presses, like ordinary metal parts. They’re sprayed into existence, layer by layer, inside a machine that looks like a cross between a microwave oven and an inkjet printer. Most everyone has seen or heard about 3-D printers that create solid objects made of plastic. But at Desktop Metal and at a rival startup in Watertown called Markforged, they’re making 3-D printers that crank out steel hinges, copper lighting fixtures, and stainless steel motorcycle parts. It’s not a new idea. Laser-based 3-D printing of metals has been around since the 1990s. But current methods take too long and are costly. Desktop Metal and Markforged believe they have found better ways to print. It could change the way people manufacture nearly everything made of metal. 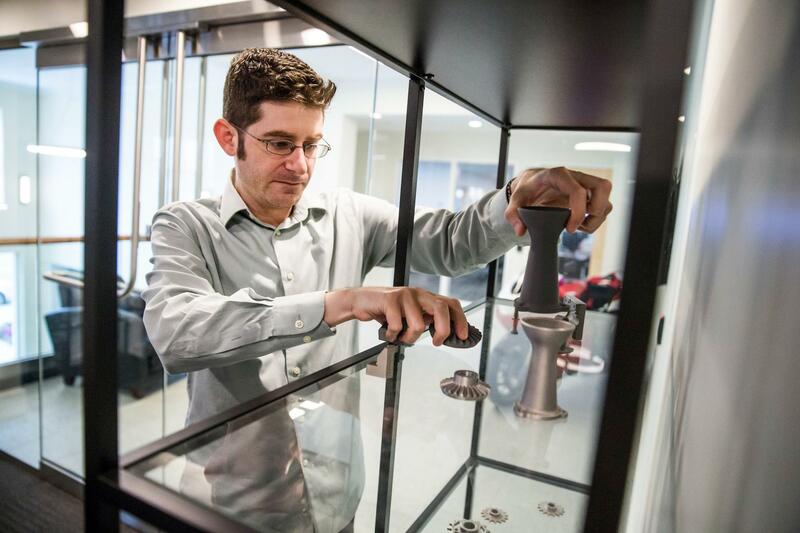 “There are many different ways to make a metal part,” said Jonah Myerberg, Desktop Metal’s chief technology officer, but “3-D printing allows you to do geometry that is not available any other way.” For instance, an engineer could someday print an engine block with cooling channels that couldn’t be made by pouring liquid metal into a mold. 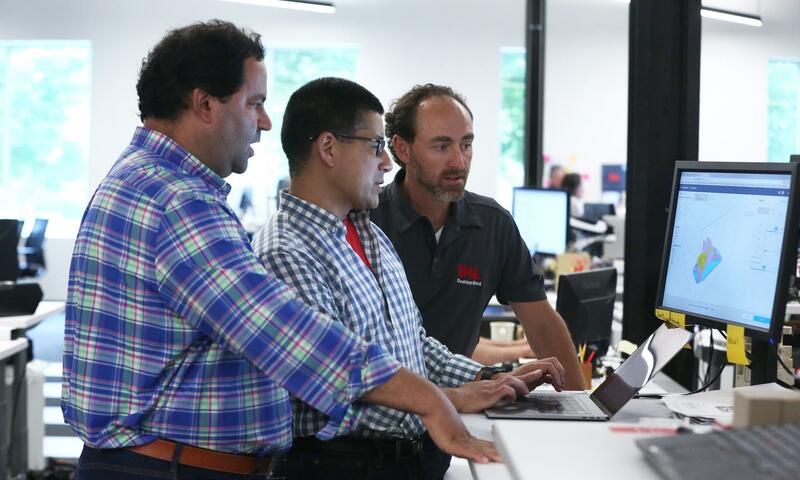 Desktop Metal co-founders (from left) chief executive Ric Fulop (cq), vice president of software Rick Chin, and chief technical officer Jonah Myerberg. In fact, you don’t need molds when printing parts. Since creating just one mold can take weeks and cost tens of thousands of dollars, that makes 3-D printing faster and cheaper. Desktop Metal was cofounded in 2015 by materials scientists from the Massachusetts Institute of Technology and by Ric Fulop, who previously founded the Waltham battery company A123 Systems. The company has raised about $212 million in venture investments from companies such as Google’s parent, Alphabet Inc.; General Electric Co.; and BMW. By year’s end, Desktop Metal plans to begin shipping its ”studio” model, a $120,000 desktop system for quickly building prototype products. But the company’s big bet is on the “production” model, a massive machine designed for full-scale manufacturing. It will make dozens of metal parts simultaneously, at up to 100 times as fast as today’s laser printers. “The speeds that Desktop Metal have reported achieving with this printer could be transformative for metal 3-D printing,” said Bryony Core, a materials scientist and analyst at IDTechEx, a British market research firm. Myerberg said the machine will cost under $1 million. Meanwhile, Markforged in September began shipping the Metal X, a $125,000 system that’s also intended for the factory floor. Metal X isn’t built for speed, but it’s cheap enough to allow companies to buy them by the dozen and run them nonstop. The idea is that 10 or 12 cheap but slow machines could generate just as many parts per day as one big, fast printer. 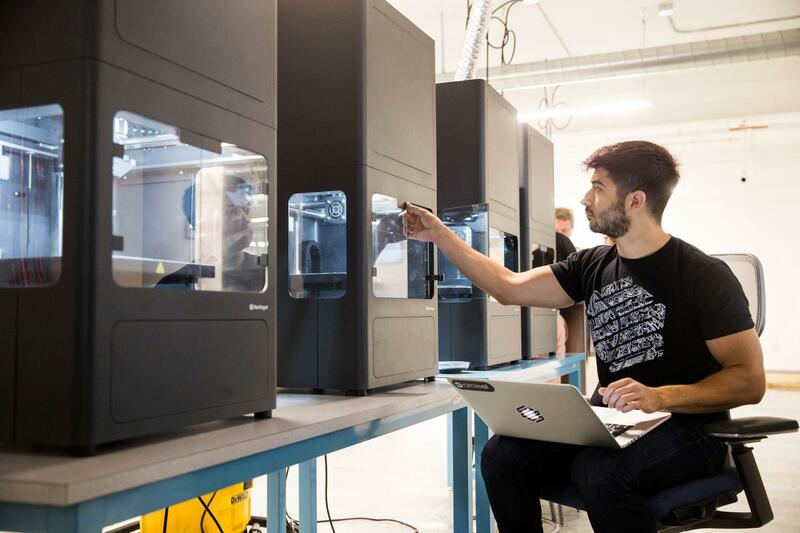 Founded in 2013, Markforged already sells 3-D printers that make plastic parts infused with high-strength carbon fiber. The company has raised about $27 million in funding from investors that include Matrix Partners, Trinity Ventures, and Northbridge Venture Partners. Metal printing starts with metal powder. The raw material, metals like steel and copper, are melted, then sprayed into a cooling chamber filled with an inert gas. The mist of liquid metal cools into billions of particles. Companies such as Germany’s Concept Laser print metal objects by spreading a thin layer of metal powder onto a platform. A high-powered laser then zaps the powder into a pattern that matches the shape of the part. The intense heat turns the powder into solid metal. The printer spreads a fresh layer of powder, the laser fires again, and the process continues until the item is complete. The process works so well that General Electric Co. bought Concept Laser last year and uses its technology to make jet engine parts. David Benhaim, with 3-D printers at Markforged. Desktop Metal and Markforged were inspired by a different manufacturing method called metal injection molding. In this system, the metal powder is mixed with plastic binders. The mixture is heated and injected into molds that form it into complex shapes. The part is then baked in high-temperature ovens that burn off the plastic material and turn the object into solid metal. Metal 3-D printing takes the same general approach, but without the expensive molds. Instead, engineers can design a complex part using standard computer-aided design programs from companies like Autodesk. The digital file goes straight to the printer. The Desktop Metal and Markforged machines squirt the metal powder and binder through tiny nozzles. Each object is built up layer by layer, hour by hour. When the print job is done, the object is placed in the same kind of oven used in metal injection molding, producing solid metal parts. Benoit said it will take time to determine whether the 3-D printed molds are as durable as the old-school kind, but he likes being able to get results so quickly. “I can’t wait to really start exploring this technology,” he said. At Desktop Metal, a stainless steel hinge is made in three stages (from left): printed metal powder and polymer, sintered (after heating in furnace), and finished.